I’ve long been a fan of mind mapping, especially on tablets, as the slate is the perfect workspace for creating and manipulating maps. My favorite app for mind mapping on mobile devices has been iThoughtsHD since the release of the iPad (s aapl), but lately, I’ve been using Thinking Space on the Galaxy Tab. It runs on smartphones, too, but I have never been a fan of mapping on the small phone screen. Thinking Space comes in a free (ad-supported) version and a paid version that removes the ads and has additional features. The app can export maps created in the program into a variety of formats common to the genre — Mind Manager and FreeMind chief among them — as well as save a map as an image and share it via email. There’s also the Thinking Space web portal that allows sharing maps with other Thinking Space users, but I haven’t used it. 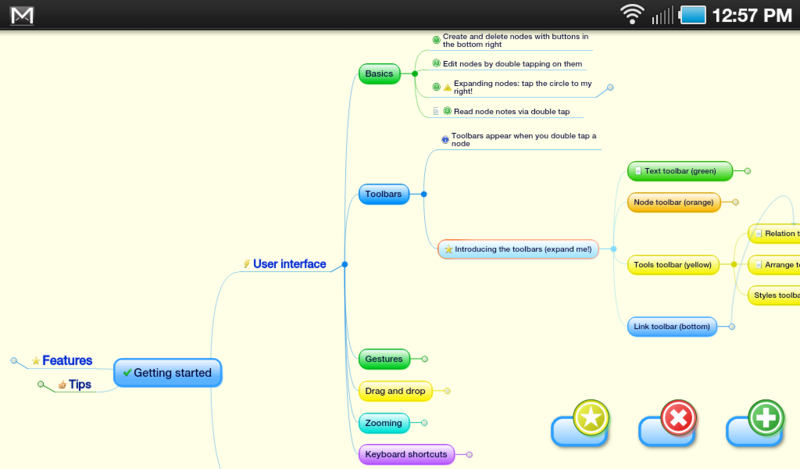 Creating a mind map is as simple as adding nodes on the screen. The nodes position automatically to provide the best use of the display, and can be dragged around the screen as desired. A full palette of display options is available to customize the look of the mind map, as evident in the image above. The interface fully supports dragging and zooming as expected. Nodes can be tied together to denote relationships, and hyperlinks to documents on the Android device can be created providing applications to view those documents are installed. There’s online documentation for the app on the developer’s web site. Thinking Space isn’t sophisticated enough to rival desktop applications like Mind Manager, but it’s good enough to create simple maps on the Android (s goog) platform. I personally use mind mapping as a visual outliner, and Thinking Space is marvelous for that purpose. The program is available in the Android Market. l use it on an HTC Wildfire. l use it as a jotter & shopping list. l have tried using it for taking notes at events but find the virtual keyboard too slow. l mostly use MindManager in Ink mode on a Tablet PC for this work. Transfers to/from MindManager work but you have to remember ThinkingSpace is a subset of MindManager e.g. 16ish versus 100s of icons. l would like to use it for knowledge maps created in MindManager e.g. Travel websites but hyperlinks in MindManager do not transfer to Thinking Space. They have to be in the topic text. l use Thinking Space a few times a week. I’ve been using this app (full version) on my nook color since I rooted it a week or so back. The 1024×600 7″ screen works wonderfully for this application. Very pleased that you’ve discovered this app James. Definitely one of my favorites. Do you use it on a phone or a tablet? I find maps too hard to do on a phone.